Comment: Steps adjacent to driveway, steps from top of driveway to front door level and path along side of garage. Comment: Concrete slab for a work shed. 15 feet by 13 feet. Gravel is in place already. Comment: Installing a 35'x22' steel pole barn on existing property. Steel barn will use 20 concrete bolts to secure to slab. Ground and site prepped. Some existing rebar onsite for use. Need estimate for forms, pouring and leveling of concrete slab (4" thick). 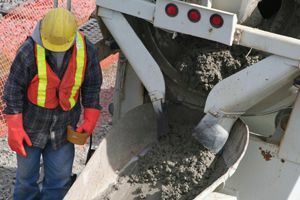 Poulsbo Concrete Contractors are rated 4.74 out of 5 based on 182 reviews of 27 pros. Not Looking for Concrete Contractors in Poulsbo, WA?